With special effects taking over the film industry with special departments working overtime to create stunning worlds, cities, galaxies and even planets from several billion pixels, a good old-fashion car wreck can be very satisfying. Car crashes might be old-fashioned but the sight of a real car smash into another or pinwheel end over end or collide with a stationary body or wall impresses the audience as they experience the coolest level of physics. You get to experience a controlled chaos, momentum and mass unfold onscreen. Ever wondered by many of the greatest action movies involves car crashes? You should checkout the below films to understand the importance of car crashes. This scene from No Country for Old Men has no frills. It succeeded in terrifyingly portraying Anton Chigurh who’s the only survival of a car crash. The scene is shot in a stripped down way which gives it a true-life, gruesome and unsettling feeling. Chigurh who’s nigh-unkillable heads out of the area to become a menace to the next unsuspecting victim that crosses his path. On getting to Glenn Close and pouring out her mind to Tom Cruise, Cameron Diaz began driving irregularly in an outward display of anger/jealousy/possessiveness. A helpless Tom Cruise finally realized that he’s with someone who’s so obsessed she’s gone loco. The scene ends with the car taking dip off the bridge in an ordinary yet horrifying experience. The Bourne franchise has seen quite a lot of car chases and eventually car crashes. This scene is coming from the second Bourne film – Bourne Supremacy where Matt Damon is riding a taxi in Paris while trying to evade the range rover of Karl Urban. The editing of this film is splendid, and there are a lot of thought processes involved as each driver tries to outwit each other. The crash scene in Christopher Nolan’s The Dark Knight is brief and to the point. However, it had an incredibly powerful visual. Think of it as the biblical David vs. Goliath fight but this time Batman (and his weaponized batpod motorcycle) versus a tractor-trailer. Instead of having a head-on collision with the trailer which would probably be sudden death for Batman, he anchors the truck’s front to several light poles which causes the semi to flip back to front. That was one understated, direct but perfectly and brutally carried out. Four attractive young women cruising down a country road and rocking to a beautiful song on the radio didn’t expect Kurt Russell’s “Stuntman Mike” to plan their brutal end with an epic car crash. With tension building up during the scene as we witness the crash happen several times each time revealing how each girl met her end from the brutal head-on collision with Stuntman Mike’s car. Whenever Michael Bay shows up, expect crazy, weird things to happen. The bad boys – Will Smith and Martin Lawrence the heroes of the movie chase down bad guys trying to flee in a double-decker car carrier. These guys are armed with machine guns and decide to cause a major commotion, releasing the cars from the carrier one after the other. The rolling obstacles are targeted at Smith and Lawrence who are supposed to avoid them to survive for the next Bad Boys movies scheduled to arrive sometime in 2017. The banter between Will Smith and Martin Lawrence and the utter challenge of this scene makes it one of the most awesome car crash scenes of all time. After successfully cheating death and it’s still craving your life, it’s ideal to keep off the highway. The combination of stunt work in a car crash and a horrendous gore splatter from a supernatural horror movie is what you get in this sequence. The result is a mind-boggling as you’d expect. Mad Max: Fury Road, the latest post-apocalyptic film from George Miller, saw enough car wrecks to make you feel this article is all about it. 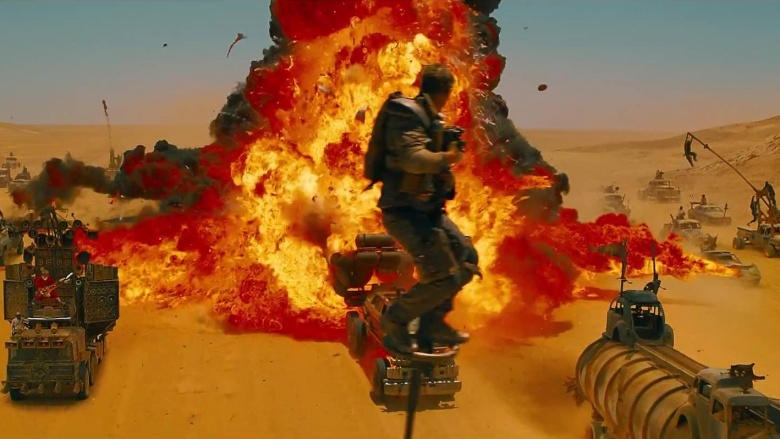 There have never been as much vehicular violence in any movie as in Fury Road. There were enough thrills (car flips, explosions and the all-round destruction race) to make the average viewer scream in excitement. But George Miller wasn’t to be outdone and added even more weird stuff like exploding spears, sandstorms, and even a guitar-playing maniac. Witness this!